Whether a student of the arcane arts, a channeller of your god’s almighty will, a gambler who has made terrible pacts in exchange for terrible power, or even one touched by the spark of divinity, you wield a power granted to few. The above is deliberately generic. If I'm going to successfully fold all possible spellcasting classes into this, then I need to go out of my way to allow methods of "spellcasting" outside the normal spellbook-and-study type methods. This may necessitate some messing around with the spell research sections as well, unless I choose to keep it like generic D&D regardless of one's power source, in the interests of simplicity. However, offhand I feel that limiting all sources of magic research and progression to such an academic formula is going to be limiting from a worldbuilding fashion, setting up images of Cambridge-like spell colleges in the wilds of the frozen barbarian north or deep within Orcish holdfasts. But this is something to worry about later. Before we delve further into magic, I want to settle the use of arms and armour. 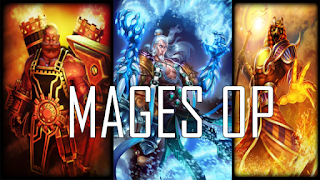 Traditionally, of course, this is simple: mages get bupkis. The reason for that was one part genre simulation and one part pure gamism. Inspiration for the original class came from robed wizards who didn't run around with battle axes (even though those certainly existed in fiction as well), and whether it made sense or not, the fighter was meant to fight and the wizard, well, was not. But if our one spellcaster class is going to encompass the maximum amount of design room (i.e. to cover the most possible number of character class concepts), then I think it's necessary to allow them to use at least some weapons and armour. I think I'll go with unrestricted weapons use, as you'll need your hands free to cast spells anyways. Since Mages are going to lack a lot of the fighting goodies that Warriors have, I don't see this as really infringing on the Warrior's role. As for armour, I will restrict this a bit: no heavy armour for the mage. However, this is a bit more complicated; I'll explain below. Okay, simple enough. Now what about magic itself? Of course, we need a way to bring out the cleric concept even if it doesn't exist as a formal class: it's too much a part of D&D not too. But beyond that, I want some way of ensuring that not all Mages are cookie cutter. With Warriors I gave them a variety of fighting styles to give players the opportunity to craft a variety of fighter types. For both classes I'm going to be using a feat-like system (heavily fenced off to ensure you don't get all the problems of 3rd ed feats; that's another post) which will give a decent amount of customization opportunities for every player. At the same time, I really feel like there should be something inherent to the Mage class that provides a sense of uniqueness to each caster. I'm sticking to classic Vancian magic (because I like it and it will greatly help in maintaining compatibility with other D&D/OSR products), so I can't really innovate there. After ruminating on this for a while, I decided to go with the concept of spell schools. 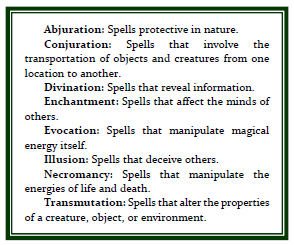 Introduced in 2nd ed (and used in 3rd and 5th--maybe 4th as well, but I never looked at that one), these break all spells into eight subgroupings. By default mages could generally use spells from any school: the school structure mainly existed to allow for class specialization (e.g. your character could be a necromancer and get extra necro spells) and mechanical tweaking in various places (e.g. "this creature is immune to illusions"). Related to all this, though something I'll discuss in more depth later, is that I was heavily inspired by Delta's Book of Spells. This was a project by him to boil spells down to their absolute mechanical minimums. One of the major things that bothers me about spells is the oceans of space they take up in any book. Delta's book uses only those spells found in the original OD&D set, so it doesn't even go past spell level 6 because the very concept of those higher spell levels was introduced later; this dovetails nicely with Expert's ending of their spell list at the same spell level. By sticking to these limited spell levels and ruthlessly purging the text of each spell, he was able to get all spells of a given spell level on a single page. 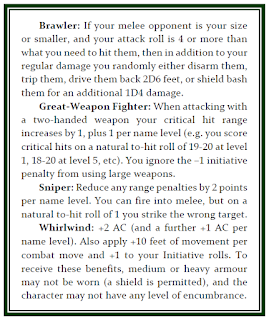 While I wanted to use more spells than just the OD&D core list, the idea of making every spell of any given spell level fit on two facing pages still seemed just fine to me: that's the entire spell section in a dozen pages. Having all spells of a given spell level on two facing pages would also make it so that each spell level was immediately accessible by a reader. As I want a small, readily absorbable ruleset, this all seems great. Fitting this into my idea for using schools, I decided that, instead of giving every Mage access to all eight schools right at level 1, I'd make them start with only four schools. At each name level (a concept I've mentioned in earlier posts; a name level is every 5th level), a Mage would get access to a new school of their choice. As such, after reaching 20th level a Mage would at last have access to all eight schools, a good level to mark a true master. Before then, you're deliberately choosing what you want versus not, shaping your Mage's capabilities and the way they play at the table and thus, hopefully, ensuring that casters don't feel cookie-cutter. This is where my earlier digression into spell lists comes in. If you look at most unrestricted spell lists (i.e. the ones where they just throw in every spell they can thing of), you'll see that 1) there's way too many spells to meet my goal of two pages per spell level, and 2) take Conjuration, Evocation, Transmutation and bugger the rest, both because of the general effect types those schools encompass but also because those schools get the most spells. If I'm going to make school choice a meaningful choice, I need to ensure that the spell list is tweaked to reflect this. Again, a full discussion of spells is really a talk for later, but at its heart I decided to go with precisely three spells per school per spell level in the core rulebook. This way, you're guaranteed to get at least the same number of spells to play with as any other Mage. By limiting spells to just three per spell level, I can at least ensure that a school doesn't become the most popular choice through sheer number of options (though of course the spells actually available will play a big part, too). This gives 24 spells per spell level to play with (well, except levels 5 and 6, because the increasing complexity of spells at higher levels meant that I could only cram 16 per level on two pages for those). For comparison, B/X grants a dozen wizard spells per spell level, plus another 6-8 clerical spells. So, even folding the two spell lists together (as I have), players will still have a little more in the way of options compared to B/X. Okay, the concept of limited spell schools alone I think will be fun. But I think we can go a bit further. After mulling it over a bit more, I realized that spell schools could also be a sort of character building currency. I want to avoid the character building mini-game so endemic to 3rd edition play, but at the same time, I wanted a bit more in the way of options than your typical B/X game. We also need to be sure that we're allowing the most number of character concepts to be created out of this single class, because again, this is the only primary spellcasting class in the game. As such, I've gone with three options for starting Mages. These options only exist at the start of the game: once play gets underway, you're stuck. At their heart, each allows you to trade away your general spellcasting flexibility for abilities elsewhere. The first two are similar in concept: they allow a Mage to be more fighty, at the expense of their access to spells. Option 1 is the ability to wear light or medium armour. Lose one school, and get up to +5 AC to compensate (and the ability to wear magical armour later in game). Option 2 is a little more in-depth: you gain the Warrior's attack progression (+1 attack bonus for every two levels). I could see this being an eyebrow-raiser. At first I had this so that it was +1 for every three levels, but this didn't make much difference early on, and with the Warrior's main class feature coming in as extra damage (in the form of extra attacks and damage dice; see my previous post), giving out the same attack bonus didn't seem as infringing: they're still never going to remotely keep up with the Warrior in melee. 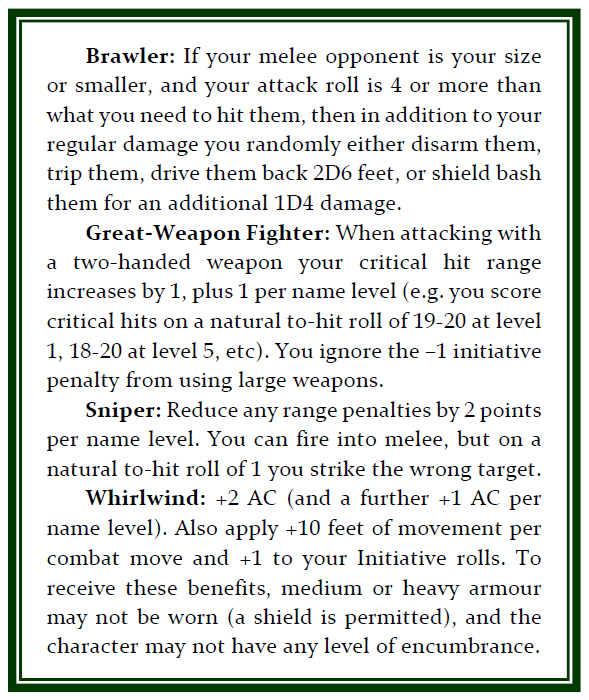 By giving both classes the same attack bonus though, it also promises to really help when balancing melee-based encounters, in that I can ensure that a mage will always be able to contribute in melee if their player made them that way. 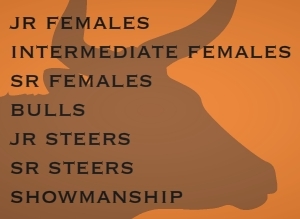 Option 3, the final one, is the concept of specialization. Again a 2nd ed idea, this lets you give up knowledge in one area of magic to increase your ability elsewhere. I've tossed the original idea of oppositional schools (in 2nd ed, when you specialized in school X you automatically lost access to school Y, its "opposite school"). The character can toss whatever school they want. So that's it: the Mage in full. Hopefully this should let a player make wizards, shamans, clerics, battle-wizards, all kinds of specialist casters, and so on, filling most of the caster roles your average player would desire. In my previous post I upped a copy of the Warrior's page. For this one I'm instead going to up both the Warrior and Mage together, so you can see how they look alongside one another as facing pages (view it in a two-page view to get the full effect). With just two classes, I can have all the character class info on two facing pages across from each other, which I think looks sharp and again aids in assimilating information. Thoughts? Of course, there's more to character creation than just classes. I think in my next post I'll dive into Simulacrum's planned feat system, and see if we can salvage something out of the famous feat boondoggle appropriate for more OSR-style play.